Production costs are expenses, such as materials and labor that your company incurs in the course of producing the product that you sell to consumers. However, low production costs do not necessarily guarantee a high quality product to the company. Quality simply means delivering to the customer what they expected-the same guarantee Andrews Sykes always keeps with their customers. 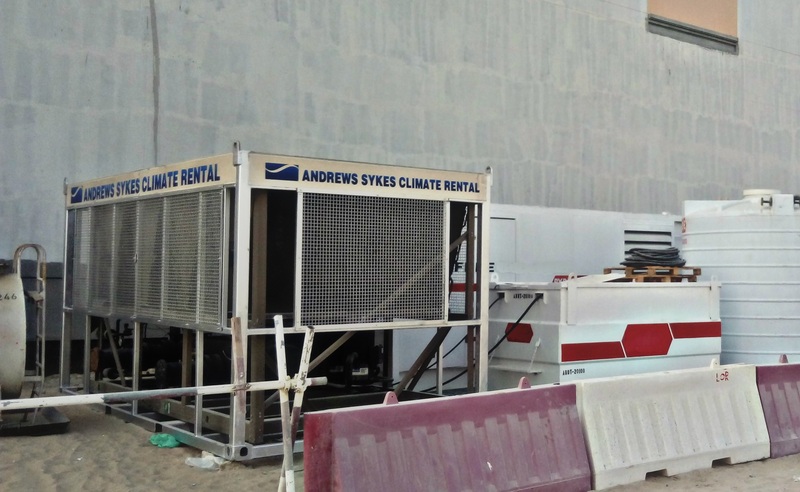 Following the failed restore of 12 year old chiller at a well-established plastic extrusion company located at Ras Al Khaima, UAE, Andrews Sykes, UAE were asked to step in and provide a solution for the intensive plastic extrusion business during peak summer. During the engineer’s visit at site, it was found that many of the heavy machineries for plastic manufacturing were kept idle due to failed chiller and this meant no production. 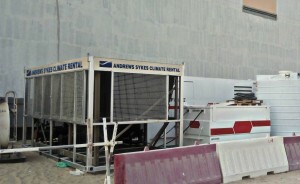 The client requirement was for 330kW cooling, Andrews Sykes proposed it with a 384kW chiller along with accessories. Delivery, installation and full commissioning were completed on the same day and therefore the factory was up and running within 24hrs. The plastic extrusion business is back on and the customer can rely for more quality products during the assured hire period. It was a great day and a great job has been done by team Andrews Sykes UAE. Special thanks must go to the transportation coordinator for reserving the exact hiab for the emergency requirement. This article was posted in chiller hire, Chiller Rental, Emergency Cooling, Process Cooling, Spot Cooling, Summer AC Rental, Warehouse Cooling and tagged chillerhire, chillerrental, climatecontrol, portableunits, processcooling, temporarychiller, temporaryclimatecontrol, temporarycooling. Both comments and trackbacks are closed.